So, people keep telling me we need Ohio. Ted has been mentioned on quite a few shortlists and would supposedly help bring home his state. He's a bit conservative for me, and the NRA loves him... but he is popular in Ohio-- he's a gov. rather than a Senator. Police and first responder orgs love him. And he seems like he would be a fighter. I think Cupcake Rollins would have a mixed reaction? Your thoughts? P.S. 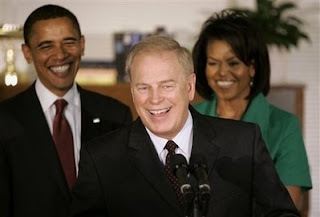 Strickland passes the tlg photo test with bonus points since he has 2x the Obama factor in his picture. P.P.S. He also says he does not want the post but insiders say he would serve if asked.